pure water, corn oil, blood plasma, steel alloys, and air. Before we tackle the individual examples of homogeneous mixtures, let’s take a closer look at the definition of homogeneous mixtures and contrast them with heterogeneous mixtures. Two or more substances combined form a mixture, a compound where the different components have their own chemical identities yet they blend together and create a distribution of the substances. It’s important to know that new bonds aren’t created nor are they broken in a mixture. The chemical properties of a mixture will not change when substances are combined together in the same environment, but the physical properties of the mixture may change. In a homogenous mixture, even though there may be many different components of the mixture, these components must be distributed evenly throughout the mixture. A homogenous mixture will only exist in one phase of matter, it will be either a gas, liquid, or solid. A homogenous mixture cannot be comprised of gas and liquid, as this would make the mixture heterogeneous in nature. In a homogenous mixture, you can’t separate out the components of the mixture using mechanical means. Studying homogenous mixtures also won’t let you see any of the individual chemicals or particles that make up the mixture. 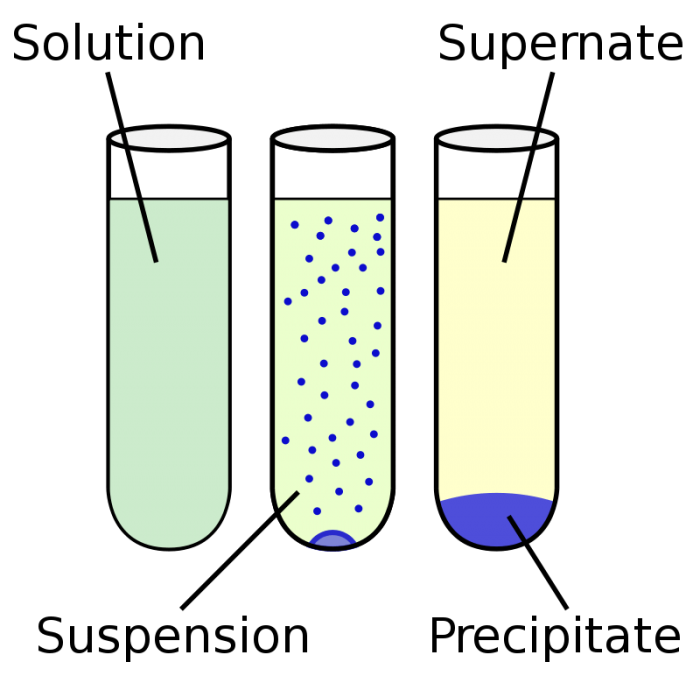 In chemistry, homogenous suspensions are those that can be divided in half and still possess roughly the same amount of material within both of the halves. 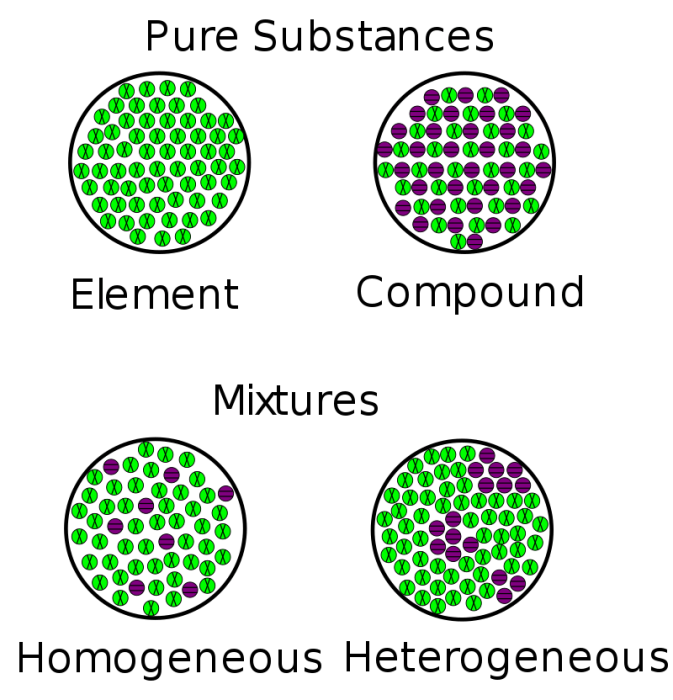 While the particles in a homogenous solution cannot be seen with the naked eye, it may be possible to distinguish them with the use of a magnifying lens or microscope. Homogenous mixtures can be categorized into three different forms: solutions (liquids), gases, and solids. Solutions are homogenous when the ratio of the solvent/solute remains the same, a condition that must hold true even if there are multiple homogenized sources within it. Solids and gases can also be homogenous in composition. In contrast, a heterogeneous mixture is a mixture where that has discrete, distinct regions which possess different properties. Heterogeneous mixtures have localized regions in them, meaning that if you take a sample of the mixture at different regions the composition of the sample will be different. Heterogeneous mixtures may have two or more phases of matter within them, and even if the heterogeneous mixture is the same state of matter, there are still different regions with distinct properties. There are some important considerations when defining mixtures. One consideration is that whether a mixture is homogenous or heterogenous often depends on scale. Consider how a sample of air appears homogenous to the naked eye, but when examined at the level of molecules the sample becomes heterogeneous in nature. Following the same logic, heterogeneous mixtures can be made from a single element. Carbon can be either diamond or pencil lead, but combining the two would create a heterogeneous mixture. Another important thing to remember is that combining two substances together doesn’t always lead to a mixture, sometimes a chemical reaction occurs and the chemical formula of the substances in altered. For example, combining vinegar and baking soda leads to the production of carbon dioxide and water, which means that a mixture has not resulted. When acids and bases are mixed together, mixtures typically don’t result. Mixtures may be described with terms that reference the particle size of the mixture’s various components. For instance, the classification “solution” is typically given to mixtures that have particles smaller than 1 nm in diameter, with particles that are extremely small in size. Solutions are almost always stable, and the processes of decanting or centrifuging can’t separate the chemical components of the solution form one another. Examples of solutions include gelatin, air, and oxygen dissolved into water. Colloids are solutions which may appear homogenous when viewed with the naked eye, but closer inspection of the colloid with a microscope reveals easily seen particles. The size of particles within a colloid usually range between 1nm and 1µm. Like solution, colloids are typically stable. Unlike solutions, colloids usually exhibit the Tyndall effect. The Tyndall effect is a phenomenon where light scatters as it bounces off particles in either a fine solution or a colloid. The components that make up a colloid can’t be separated out using decantation, although they can be separated through centrifugation. Suspensions are mixtures which look heterogenous even when looked at with the naked eye. If you want to keep the particles in a suspension from separating you typically need to use a stabilizing agent. Like colloids, suspensions also display the Tyndall effect when light passes through them. Because of the large size of the particles which are found in suspensions, they can be isolated from each other by the decanting or centrifuging. Sand mixed with water, mud, dust in the air, and granite can all be referred to as suspensions. The homogenization process is responsible for giving rise to a homogenous mixture from a heterogeneous mixture. Consider how homogenized milk is created. Natural milk will separate into different layers, with the cream on top and the liquid part on the bottom. Natural milk usually only has the appearance of a homogenous mixture when shaken up. To get milk to the condition that it is in when it in on store shelves, it undergoes homogenization. Homogenized milk is processed with special instruments to ensure that the milk’s components don’t separate out and that the milk stays as a homogenous mixture. Now let’s look at some specific examples of homogenous mixtures. Homogenous mixtures include mixtures such as laundry detergent, blood plasma, vinegar, and coffee. Blood plasma is a substance found within the blood, and it is what suspends the red blood cells within a fluid. This blood plasma makes up about half of the volume of the blood in the body. Meanwhile, a cup of coffee can be considered a homogenous mixture, as long as cream or sugar has not been recently added into the coffee cup. 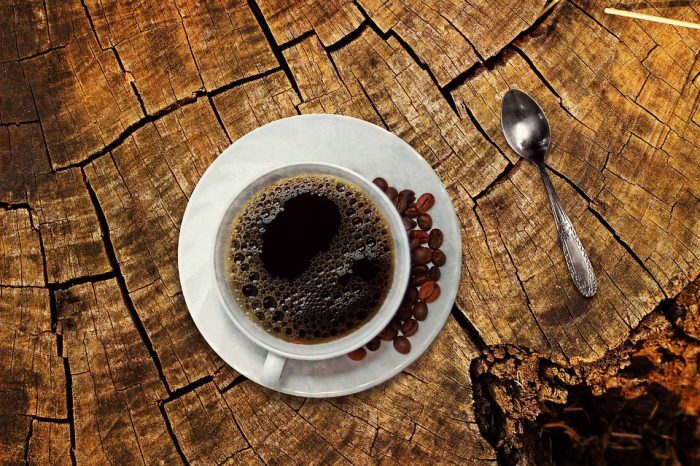 Coffee is typically considered a homogenous mixture because the grounds have been strained out coffee, leaving just the coffee extracts and the water blended together in a uniform distribution. However, if cream or sugar have been recently added into the coffee and they are still in the process of dispersing into the coffee, it is a heterogeneous mixture. Once the cream/milk has dissolved completely into the coffee it becomes a homogenous mixture. Vinegar is an example of a homogenous mixture made up of flavoring and acetic acid used to cook a variety of meals. While vinegar may have different components to it, and be sold in different concentrations, the chemical components which comprise the vinegar are uniformly distributed throughout the mixture so it is a homogenous mixture. Consider laundry detergent as well. Even though laundry detergent is made up of various cleaning chemicals intended to do different things, like get the dirt out or get grass stains out, when you pour the detergent into your washing machine you can’t see clumps of these individual chemicals because the mixture is homogenous in nature. Let’s contrast homogenous mixtures with heterogeneous mixtures. One example of a heterogeneous mixture is soda, which is made out of water, sugar and carbon dioxide. The carbonation in soda is what gives it bubbles. There are a variety of flavorings, sugar, and water in soda, but it is the carbon dioxide bubbles that appear randomly throughout the solution that make it a heterogeneous mixture rather than a homogenous mixture. Concrete is another, perhaps counterintuitive, example of a heterogeneous mixture. Cement, water, and aggregate are mixed together to make concrete. Orange juice with pulp is a heterogeneous mixture as well, with the bits of pulp more or less randomly distributed throughout the juice. Another example of a heterogeneous mixture is soil, which is composed of various elements and minerals clumped together in seemingly random arrays. Here’s another example of a heterogeneous mixture – cereal in milk. Cereal in milk is an example of a heterogeneous mixture in multiple ways, because not only is the cereal suspended in the milk a mixture, but milk can be a heterogeneous mixture itself. There are a few principles you can use to help you determine if a mixture is heterogeneous or homogenous. To begin with, remember that in the case of a homogenous mixture it doesn’t matter where in the mixture a sample is taken, the composition of the sample will always be the same. By contrast, the sampling location in a heterogeneous mixture will have an impact on the composition of the sample. As an illustrative example, let’s assume you have a large jar full of candies. If the entire jar consists of blue candies, then it doesn’t matter where you draw a sample of candies form, all of them you get will be blue. This makes it a homogenous mixture. 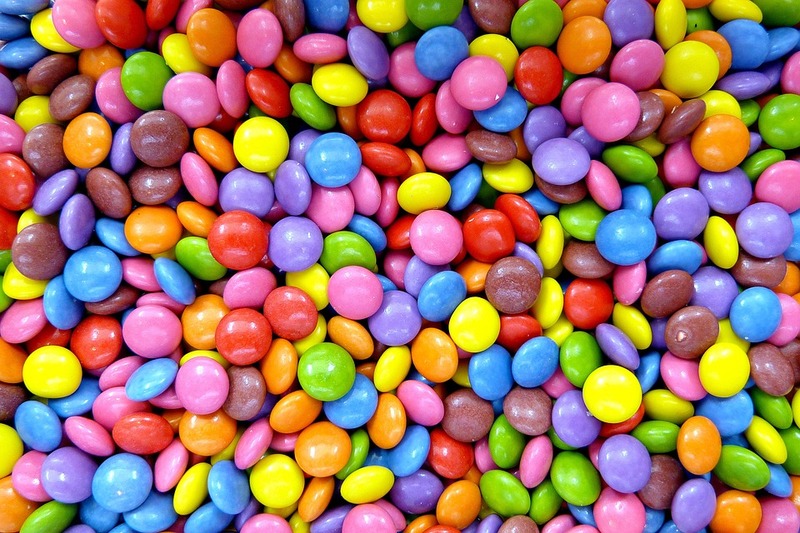 A heterogeneous mixture would be a combination of greed, red, blue, and yellow candies. You would get a different mixture of candies depending on where you took the sample, and that makes it a heterogeneous mixture.